SMSReader is a parallel port Sega Master System cartridge reader/writer. By default, it can read standard US and European SMS cartridges, and can write to battery-backed SRAM memory in such cartridges. Sega SG-1000, SC-3000 and compatible cartridges and cards. Sega Mark III (Japanese Master System) cartridges and cards. equivalent) or a DOS-based version of Windows, i.e. Windows 95/98 or Windows ME. A bidirectional (PS/2 compliant) parallel port is required to support the hardware. Firstly, the SMSReader is intended to allow you to back up your own original cartridges (known as "dumping" the ROM), so you can use them with emulators such as Meka, Smeg, FreezeSMS, Dega etc. Although most Sega 8-bit cartridges have already been dumped (thanks to projects like SMS Power), not all of them have been. (I suspect that many undumped variants of released games remain undiscovered!) Additionally, locating good dumps of your favourite games on ROM sites can sometimes prove difficult. If you intend to actually release the dumps you make, as opposed to just making dumps for your own personal use, please read the Guide To Responsible Dumping. A second function is to allow the transfer of saved games between emulators and the real SMS console. Games such as Phantasy Star contain a battery backed SRAM chip which is used to save your progress. The SMSReader will read the contents of this chip and thereby allow you to continue your game in an emulator. When you're ready to continue playing the real thing, the SMSReader can write the updated save file back to the cartridge. Finally, the SMSReader can take ROM files you've downloaded, and write them onto specially modified, battery-backed RAM cartridges so you can play them on a real SMS, instead of on an emulator. This also facilitates the development of home-brew SMS programs which can then be run on the real console. I'll now explain how the SMSReader works. You don't need to know any of this in order to build and use the device, however, so don't worry if anything seems difficult to understand. The design uses a pair of CMOS 4040 counter ICs for addressing - one for the low byte, one for the high byte. The entire Z80 address space of 65536 bytes (0x0000 - 0xFFFF hexadecimal) is covered. In effect, the address space is treated as a continuous "loop of tape", but since we are dealing with large, contiguous blocks of data, 16 kilobytes or more in size, this isn't really an issue. The counters can be clocked very fast, so any memory location can be accessed reasonably quickly. Four control lines are available from the parallel port (three inverted, one non-inverted) and the SMSReader uses all of them. INIT is used for write enable and is connected directly to the WR line on the cartridge. AUTLF is used to reset the counters before a read/write sequence is commenced. STB is connected to the CLOCK pin on the low counter and is used to increment the counter. Finally SEL is used to set the RD pin high during write mode, disabling data output from the "ROM" area of the cartridge. The MC-F pin is low only for addresses 0xC000 - 0xFFFF. The M8-B pin is low only for addresses 0x8000 - 0xBFFF. 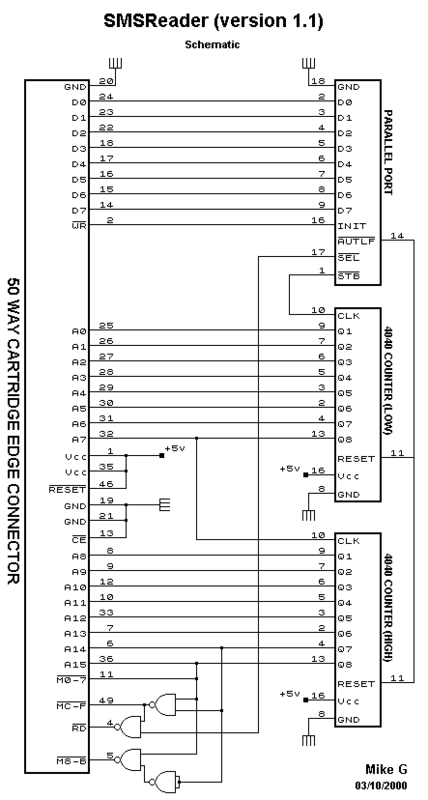 The RD pin is low only when the address is 0x0000 - 0xBFFF and when the parallel port SEL pin is high. The SMSReader is built on Veroboard (or "strip board") - a SRBP board with 0.1 inch pitch holes and copper strips on one side, forming "tracks" to which components can be soldered. It's a common means of building prototypes or homebrew projects, without the need to etch a custom printed circuit board. Wire links are used to make connections between the components on the board. Power is obtained from an unregulated DC power supply, such as the one provided with the Sega Master System itself. A 7805 regulator and associated smoothing and decoupling capacitors are used to provide the 5 volt supply required by the ICs and cartridge. As mentioned previously, the Z80 in the Master System can only address 65536 bytes or 64 kilobytes in total (0x0000 - 0xFFFF hex). How, then, are cartridges of 1 Megabit (131072 bytes) and above implemented? 315-5208 - up to 8 16k ROM banks, giving a total of 128k (1 Megabit). Mapping at slot 0x8000-0xBFFF is supported. 315-5365 - up to 32 16k ROM banks, giving a total of 512k (4 Megabit). Mapping at slots 0x4000-0x7FFF and 0x8000-0xBFFF are supported. 315-5235 - up to 32 16k ROM banks (512k or 4 Megabit) plus up to 2 16k banks for battery backed RAM allowing saved games. Mapping at slots 0x4000-0x7FFF and 0x8000-0xBFFF are supported (RAM is mapped only at 0x8000-0xBFFF). Codemasters games (Fantastic Dizzy, Cosmic Spacehead, Micro Machines, etc.) use a different, and incompatible, type of mapper. They aren't supported by the SMSReader at this time. Most Sega-made cartridges do not actually have separate mapper ICs, but instead have the mapper hardware built into a custom ROM. The functionality is identical to that described above, however. 0xFFFC - write 0x08 to select battery backed RAM bank 0, 0x0C for bank 1, 0x00 to deselect battery backed RAM. If RAM is selected, the selected bank will be mapped from 0x8000-0xBFFF. 0xFFFD - Slot 0. Write the bank number here, and the top 15k of the selected bank will be mapped at 0x0400 to 0x3FFF. Not actually used by any commercial games, but supported by 315-5235 and 315-5365 anyway. 0xFFFE - Slot 1. Write the bank number here, and the selected bank will be mapped at 0x4000 - 0x7FFF. 0xFFFF - Slot 2. Write the bank number here, and the selected bank will be mapped at 0x8000 - 0xBFFF. Writing to SRAM on cartridges which support it is accomplished in the same way. That concludes our overview of the SMSReader and how it works.